This pretty little Prout is very easy on the eye and it's easy to see her great, deep and safe looking cockpit, along with the ample space on her upper deck. She comes with an unbelievable amount of stowage both above and below decks and her accommodation offers up everything you'd expect - plus more - she's very well equipped for longer trips, lots of gear has been added over the years. She should offer comfort afloat for two, but you'd need to check her space suits you - larger framed folk probably need not apply, as she is cosy down below. 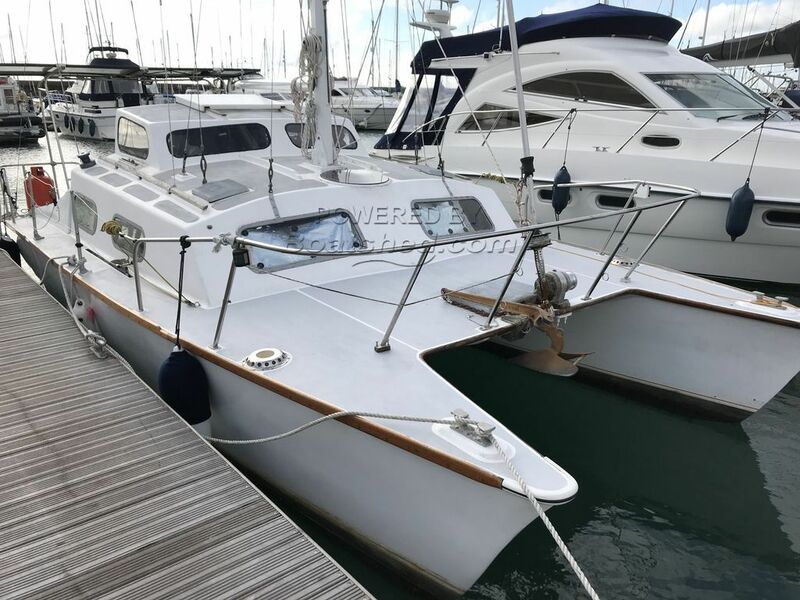 With a good clean through and some cosmetics, this boat represents good value and if you like Prouts, or want a catamaran to sail in, or potentially live on at another location, then we recommend a look at her. This Prout Ranger 27 Catamaran has been personally photographed and viewed by Tim Kingston of Boatshed Brighton. Click here for contact details.